Cleaning isn’t generally a fun task. I mean, most of us hate doing the washing up, hoovering the house, cleaning the car… all of those and more, right? So, this may be something that you’d do anything to avoid. However, if you’re a musician and you want your guitars to last a lifetime, then cleaning them is a must to ensure their longevity. What causes your guitar to develop dirt and how to prevent it. How to efficiently clean a guitar. Which products to use to clean a guitar without damaging its finish. Later in the article, we go into far more detail about the points below. However, if you want to cut to the chase then follow these concise steps to make your guitar shine like new! 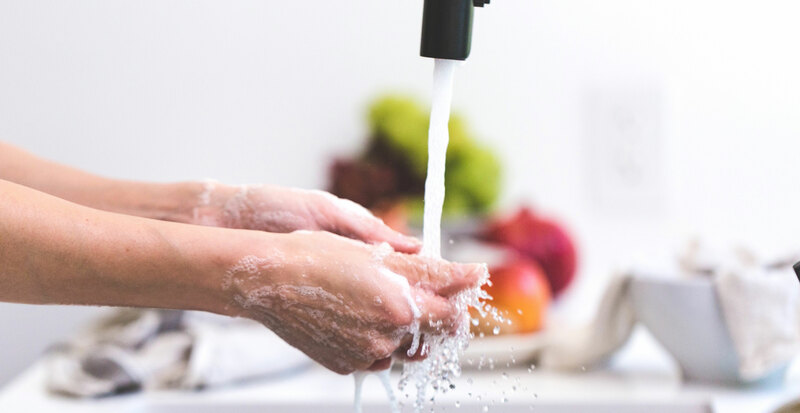 Wash your hands – It’s obvious, but it’s also the most important thing! Remove the strings – This will make cleaning the body and fretboard far easier. Clean the fretboard – Use fine steel wool to remove stubborn gunk from Rosewood/Ebony/Pau Ferro fretboards, and apply Lemon Oil to re-hydrate. Use a damp cloth to clean Maple fretboards. Polish the guitar body – For Poly-finished (gloss) guitars, spray guitar polish onto a soft cloth and wipe down. Use a dry part to buff out the polish. For Matte/Satin/Nitro-finished guitars, use only a dry cloth. Refresh the hardware – If you want your hardware to shine, use a soft cloth and a tiny amount of guitar polish to remove dirt or dried sweat. WD-40 can be used to remove thicker grime or rust. How Does a Guitar Get Dirty? The dirt that your guitar builds up depends a lot on the environment that you play the most in, and for how long. 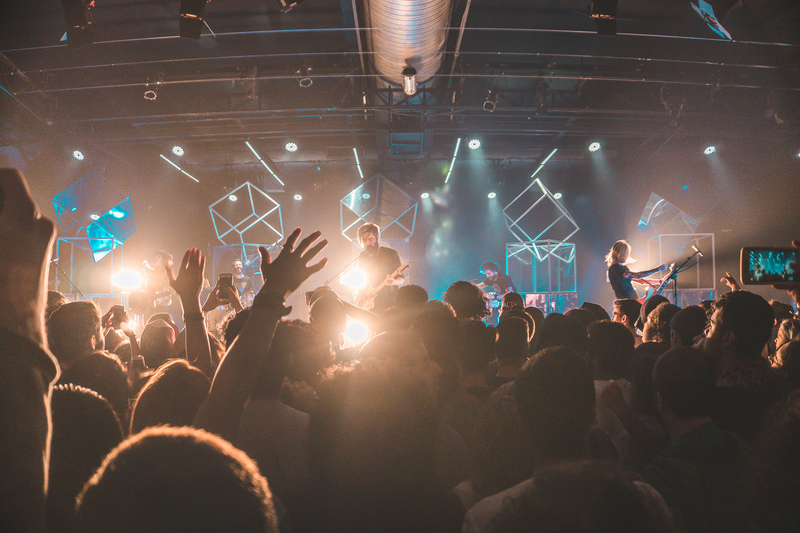 For example, if you’re someone who goes out and gigs most weekends, then you’re probably more than used to enduring 1000-degree stages and standing under enough lights to guide a plane in for landing. Playing an hour set under intense stage lighting makes you sweat. Worst thing for your guitar! However, if you practice between 1-2 hours a day at home in a cool, well-ventilated room, then your guitar will probably not require cleaning very often. It’s all about context. How Do I Keep my Guitar Clean? Before we get into the nitty gritty of how to clean certain aspects of your guitar, it’s worth mentioning methods that you can try to stop your guitar from building up grime in the first place. It’ll save you time and effort in the future. Trust us! Before I pick up my guitar, I always wash my hands. That’s my life hack – and you guys can have it. To be honest, lots of players already do this. But you’d be very surprised by the number of players I’ve seen who have picked up their guitars after eating greasy food and then wondered why their axe is plastered in smudged fingerprints, and the strings sound like rubber bands. It’s such a simple thing to do; not only keeping your guitar clean but also allowing you to eek more life out of your strings. This saves you both time and money, as you won’t have to keep buying new strings and spending ages changing them! Wait around 10 minutes for your hands to fully dry, then play away to your heart’s content. It’s also worth mentioning products such as GHS’ Fast Fret or Jim Dunlop’s Ultraglide 65, which are great to use to extend the life of your strings. Just apply these cleaning lubricants to the strings to remove any grime, and you will get sparkly-sounding freshness as well as a better playing experience thanks to a smoother feel. These products also help to remove fingertip-induced dust and dirt from the fretboard – two birds, one stone! You may not want to hear that, especially if you like to exhibit your guitars on the wall. However, the major downside of leaving your guitars out is that dust will easily accumulate on them. Dust isn’t necessarily as big of an issue as sweat; however it can build up in the crevices of your guitar and affect its electronics and their functionality. You know that crackling noise you’ve heard when moving the pickup selector? Or when rolling down the volume pot? Nine times out of ten, dust is causing that. This can be fairly easily resolved by removing the cavity plate on the back of your guitar and blowing the dust out, but if you own a Strat or a similar guitar where the electronics are attached to a scratchplate, this is more of a headache. So, putting your guitar back in its case (hardcase or gigbag) is recommended. It will keep your guitar mostly dust-free, and will ensure better reliability. Inevitably, your guitar will need cleaning at some point, even if you follow the above recommendations. You can clean your guitar without removing the strings, but a thorough clean may make this necessary – not to mention a lot easier! As a rule, I generally schedule cleaning my guitar with when a string change is needed. It just makes more sense. So first off, wash your hands (the most important thing!) and set up an area to place your guitar. I’d highly recommend cleaning it in a well-lit area so that you can easily spot all the imperfections and places that require the most attention. You can set up the guitar on a workbench or table/desk, or even just rest it on your lap if you prefer. 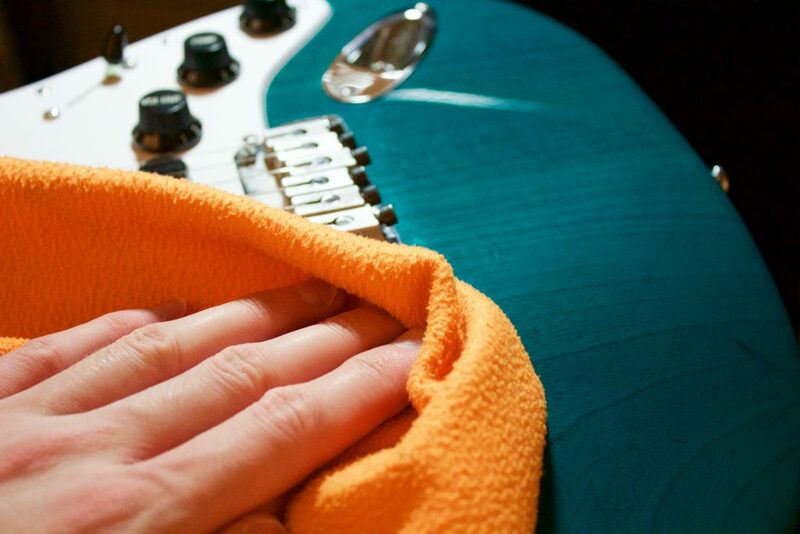 This is probably the most important part of your guitar to clean frequently. The fretboard is the part of your guitar that gets subjected to the most wear and punishment, and excessive build-up of sweat and dust can cause permanent damage if you’re not careful. When sweat dries and evaporates it dehydrates the wood, which can lead to cracks developing and can form everlasting marks. Below we have specified ways to clean the main fretboard materials that you’ll find on most guitars. The Guitar Fingerboard Kit from Jim Dunlop is perfect for cleaning rosewood/ebony fretboards. If you’ve been super lazy and a lot of gunk has built up on your guitar’s fretboard, then steel wool might be essential to use. If you do, then make sure to only use 0000 steel wool. It’s fine steel fibres will remove any unwanted dirt without causing damage or wear to the frets – in fact it will even polish them to an extent. Wear some latex gloves, and gently rub the wool into the fingerboard making a circular movement to ensure ultimate effectiveness. After you’ve done this, wipe away any debris and make sure the surface is clear. Now you can move on to conditioning the fretboard, which rehydrates the wood and deeply cleanses it to look like new. Products such as Jim Dunlop’s Guitar Fingerboard Kit or Lemon Oil are perfect for cleaning and conditioning. You can apply this with a damp cloth or toothbrush, or combine this with the previous step and rub it onto the board with the steel wool. Be generous with the amount you use however. What you don’t want to do is completely drown the board, as it will potentially cause warping issues. Just be sensible! Maple fingerboards are more susceptible to showing dirt and marks than rosewood or ebony boards, due to their lighter wood tone. And what adds insult to injury is that conditioner products cannot be used on maple. So, what is the best way to clean a maple board? One of the best ways to clean an unfinished maple board is to use ultra-fine 0000 steel wool. This removes dirt without causing damage to the frets. A slightly damp cloth can also be used, especially on satin-finished maple – but generally avoid using anything other than this. 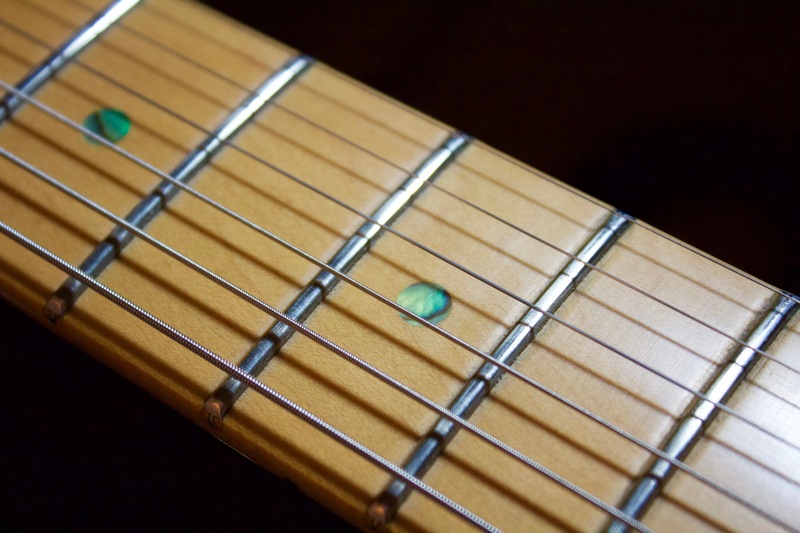 A maple fretboard that has been lacquered should be cleaned only with a damp (or dry) cloth. Using steel wool will take away the shine and leave a matte-like finish, whilst lemon oil will dull the finish and similarly take away the sheen. 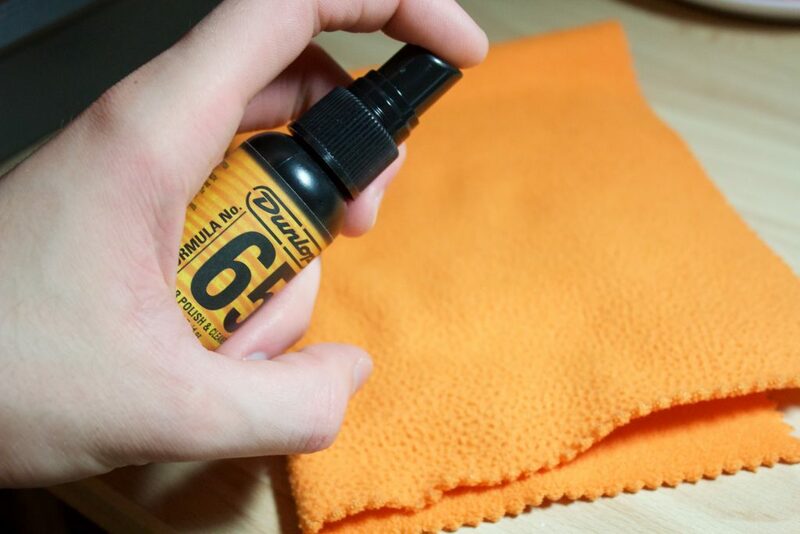 Strictly use a dry or lightly dampened cloth, or you could even use a little bit of Jim Dunlop Formula 65 Guitar Polish if the lacquer is very thick. It’s unavoidable for the body of your guitar to also build-up some marks and grease over time, no matter how careful you are. Luckily for you, the body is easier and less-intimidating to clean than the fretboard. However, the finish of your guitar must be considered too, so make sure to be aware of what finish your guitar has before you go ahead and clean it. For all of the finishes below, make sure to use a soft cloth when wiping down the body. The Jim Dunlop Polish Cloth is a great lightweight cotton cloth that you can easily store in your guitar case or gigbag. The majority of mass-produced guitar are finished in either a polester or polyurethane finish, which gives a glossy protective layer to your instrument. This makes it the easiest finish to clean as it doesn’t leave the wood porous or absorbent. You can therefore use a variety of polishes or waxes to give your guitar a look worthy of being in a showroom. You can finish it off with some Jim Dunlop Platinum 65 Spray Wax for a professional “good-as-new” aesthetic if you want to. The great thing with the wax is that it provides a grime-resistant protective barrier for some time, meaning that your instrument will stay clean for a lot longer. Remember to avoid using lemon oil or typical household cleaning products on guitars, as they contain substances that will dull and degrade the finish. It’s almost always best to stick with specialist products when dealing with your pride and joy, so check out our full range of maintenance and cleaning products here. A matte finish should only ever be cleaned with a dry cloth. If you have ever owned a matte-finished guitar, you will be aware that over time the finish will wear down and shiny spots start to develop where your hands have made the most contact (such as above the bridge where your right hand rests). This means that using a polish or wax will only exacerbate this problem, so it is best to wipe a dry cloth very gently onto the guitar’s surface and to avoid cleaning solutions. Satin-finished guitars have more of a semi-gloss look, but have a similar smooth feel to matte-finished instruments. In regards to cleaning guitars with a satin finish, the same process applies and only a dry cloth should be used. A slightly dampened cloth would also be okay if a really thorough clean is necessary. Nitrocellulose-finished guitars are more uncommon these days, however Gibson and Fender use this old-school finish on many of their high-end custom shop models. A nitro-finish is considered to be more “breathable” for the wood, as it leaves it porous and open on the surface. This finish wears over time, and generally you should again try and avoid using strong polishes to clean it. If you really need to, dampen the cloth with some water but make sure the cloth is fully wrung out beforehand. Cleaning the hardware on your guitar is something you also have to be fairly careful with. Metals are prone to corrosion, and the salts in sweat and skin oils can cause rust to develop over time. 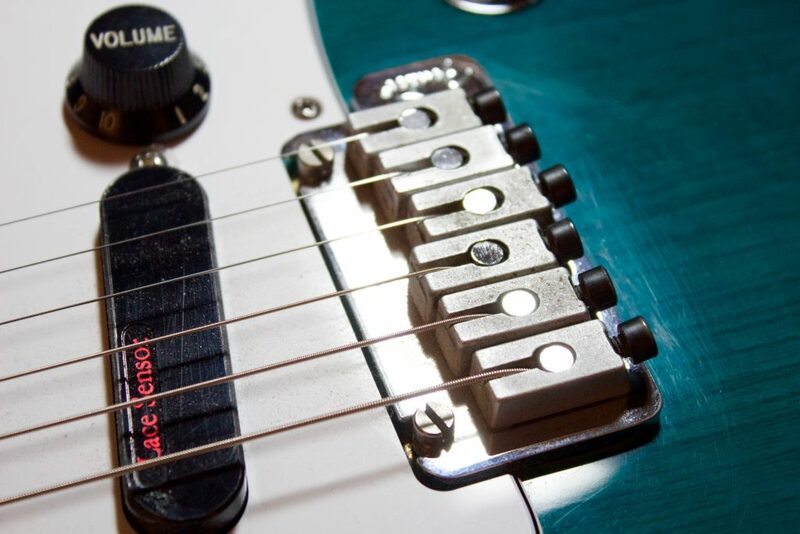 The most prone pieces of hardware on your guitar are the bridge, pickups and frets. Most guitarists rest their picking hand on the bridge, so dried sweat can develop on the saddles. The same applies with pickups that have open coils, and rust can start appearing if you don’t pay attention to these areas. It is best to clean hardware with a soft cloth using only a very light amount of guitar polish. The polish can help to remove any dirt, whilst the soft fibres in the cloth will bring the shine back. Just make sure to leave no polish residue on the hardware, as this could corrode the metal slightly. Hard to reach areas (like between saddles on a tune-o-matic bridge for instance) can be cleaned using a cotton bud – great for removing dust. If the hardware on your guitar is very badly affected by corrosion or rust, then it might be best to remove those components and give them a more intense clean. WD-40 can be used to tackle thick grime and rust, applied using a toothbrush. If you do use this then make sure the pieces of hardware that you’re cleaning have been removed from the guitar first, as getting this substance on the instrument could damage the finish. For the most part, cleaning an acoustic guitar is no different to cleaning an electric. You’re unlikely to find acoustic guitars with Maple fretboards, however the majority of them will feature either Rosewood or Ebony boards like their electric counterparts. This means that lemon oil will suffice; not only cleaning the material but rehydrating it too – giving it a new lease of life! Acoustic guitars can also be finished in protective polyester or polyurethane finishes too, but unlike electric guitars, you’ll mostly come across natural or satin-finished acoustics. A lot of modern acoustics will have this finish as it is more porous, which lets the wood breathe. Tone-conscious acoustic aficionados believe that this results in a more resonant and open sound. Therefore, you should apply the same rules that I mentioned above for cleaning matte and satin-finished instruments. Generally, employ only a dry cloth and a little bit of water if you have to to remove stubborn marks. Job done! A clean guitar simply looks and feels better than a dirty, grubby instrument. It’s also imperative to keep the guitar clean if you want it to last and not have to replace any of the parts after a few years. Look after your guitar and your guitar will look after you. Do you have any other useful tips or recommendations for cleaning guitars? Let us know by leaving a comment below! Interested in finding out more about music gear and expanding your knowledge? Click here to view all of our Learn articles. Hi Elliot I understand all the errors that can be made and i know you mention Jim Dunlop products, is it because you sell them in the store. That’s an interesting method but it isn’t something I’ve personally tried, so I can’t offer much insight unfortunately! Regarding the mentions of Jim Dunlop products, you are correct that we sell many of their cleaning solutions/waxes, however I have used Jim Dunlop products for years (long before I started working for Andertons) which is why I recommended their gear in this article.